With over 30,000 trees planted over the last twenty years, Mark and Lynne Peterson’s irrigation dairy farm, near Nathalia in north central Victoria stands out as a lush green oasis in the midst of farms that are relatively bare. The atmosphere created is one of life, fertility and lushness, surprising in a district whose long-term annual rainfall is only around 375mm. Mark’s father and mother bought the original 123 acre/50Ha irrigation farm in 1976. With several extra purchases the farm now totals 450acres/180Ha. During the 1983 drought, when times were very hard, Mark’s father bought a backhoe business and Mark became the share farmer. A few years before, he had completed a farm apprenticeship through Shepparton TAFE. In the third year of his apprenticeship, the instructor organised a visit to a Biodynamic dairy farm at Cogupna. He told the students that this farmer didn’t have any trouble with bloat, didn’t have to chemically drench his cows, and didn’t have much mastitis. The other apprentices scoffed and said that this was not possible, but Mark was intrigued, and asked many questions. The farmer was milking 60 cows on 50 acres/20Ha (with irrigation), and carried his replacements, only buying in a bit of hay and small amounts of grain. The cows looked magnificent, and pastures were lush and dense. This greatly impressed Mark, along with the fact that it was a more or less self sufficient, low cost operation involving no chemicals and virtually no fertilizer inputs. Later, in the mid 1980s, Mark and his dad watched A Winter’s Tale, the ABC TV feature on Alex Podolinsky and Australian Biodynamic farming. Dairy farming margins were very poor at the time (as they are now), and Mark could see they were getting nowhere. He said he wanted to start Biodynamic farming, which seemed like a low cost, healthy alternative, and his father agreed. They contacted Trevor Cobbledick, a BD cattle and grain producer at Nathalia for guidance. Mark started spraying 500 in 1987. The effects weren’t instant, but crept up on them slowly. They made an initial mistake by stopping drenching their cows and calves straight away. The calves looked terrible after a while and Mark realized that they couldn’t just go cold turkey, but have to wean the animals off chemical drenches slowly. Trevor advised him to keep the animals moving through a good pasture rotation. Mark drenched the calves and they got through OK. The milkers didn’t need chemically drenching. After three years of Biodynamics, (during which Mark and Lynne bought the farm) the calves (which looked very healthy) were tested for worms. The reading was so high the vet rang and said Mark should drench them immediately. He asked Trevor what he should do. Trevor said “what would you have done if you hadn’t seen the test results?” Mark said “nothing”. Trevor said “well do nothing and see what happens”. So he did nothing. A few months later, after another test, the vet said “so you drenched those calves?” Mark said “no”. The vet was amazed, as the calves, apart from one or two, had almost non-existent worm counts. After 30 years of Biodynamics, Mark and Lynne’s soil has changed from a red loamy soil only a few inches deep, with clay underneath, to an almost black topsoil which extends to 450mm depth. This has puzzled earthmoving contractors, and machinery salesmen who know the area’s soils intimately, and can’t understand why this soil is so much better. Mark and Lynne supplied Demeter certified Biodynamic milk (along with several other Victorian Biodynamic dairy farmers) to supermarkets for over a decade. It was distributed widely until extended drought reduced supply and led to it being blended with organic milk. The Biodynamic Marketing Company, came up with a solution, agreeing to buy their milk at the same price as they had been getting, and organize delivery to a dairy factory in Kyabram for processing. BD Marketing would then distribute the milk through health food shops in Victoria. This was a risky project for the BD Marketing Company as they had to sell over 6000 litres a week to break even, but it wasn’t long before they were looking for additional suppliers. Mark sprays prepared 500 (stirred in a 20acre/8Ha stirring machine) with a reciprocating sprayer, twice a year on the perennial pastures (spring and autumn) and once a year (autumn) on the annual pastures. Summer crops are also sprayed with 500. Mark irrigates, then, when he can drive on the paddock and the tractor tyre cleats are just making an impression, it is ready to spray. If the cleats are sinking in, it’s too soon, if they make no impression it’s too late. 501 is never needed in this low rainfall, sunlit climate. The Peterson’s maintain a mix of perennial and annual pastures. During the long drought, annual pastures had to predominate because of the difficulty of keeping perennial pastures going with inadequate water allocations. Perennial pastures comprise rye grass, white clover, paspalum, chicory, plantain and many other lesser but nonetheless important species. Annual pastures include sub clover, Persian clovers, Shaftal and others. Mark is no longer growing the winter active fescue (it was too coarse for the stock) and is moving away from perennial ryegrass and into the summer fescue. The new varieties are highly palatable for the cows and it can tolerate the hot temperatures they get in summer. Over-sowing existing pastures is used extensively to re-establish species after drought or to rebalance pasture composition. Perennial pastures are over-sown every 3 years or so. Mark has learnt that when ploughing up a paddock using the Rehabilitator plough (Biodynamic plough), it does leave the ground quite soft, and it is often best to grow a cereal crop in the first year before re-sowing to pasture and grazing. If sowing fescue, it requires a fine seedbed on top, dropping the tiny fescue seed on top, pressing it in with tyres and getting it well established before grazing. Provided enough irrigation water is available, Mark plans to start green manuring a paddock or two each year to really intensively improve the soil. Pastures are harrowed after the cows move on, to spread the manure evenly. 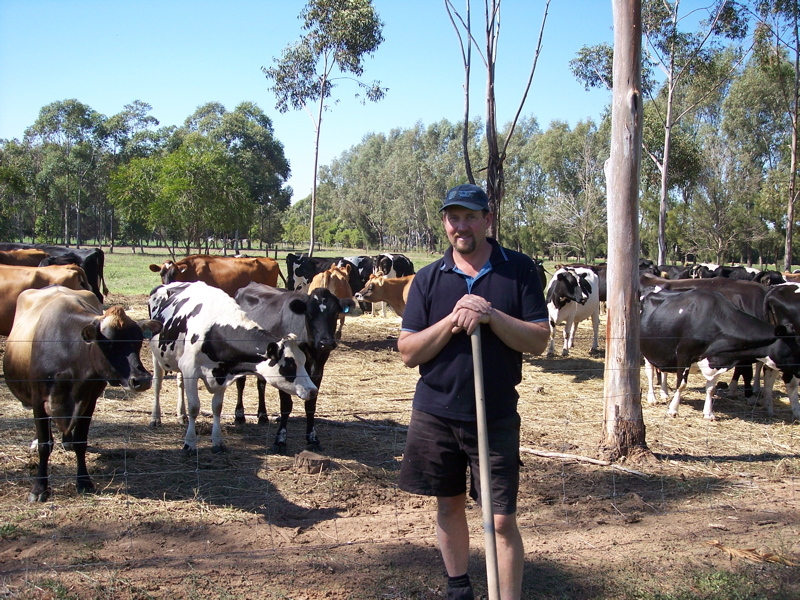 Mark uses a very wide set of pasture harrows and can do a paddock in 15 minutes or so. The best time is in the morning while the dew is still on the grass. Weeds are generally not a problem. Some species that are regarded conventionally as weeds are actually relished by the cows and are highly nutritious under Biodynamics. A few thistles come and go. They are opportunistic weeds that come when soil is disturbed, and don’t like irrigation or competition. They do their job and then disappear. Paterson’s Curse is hand pulled if it appears anywhere. Bindii’s come in on trucks and milk tankers, but again they don’t like competition. Manure harrowing plays a very important part in weed management as cow pats left in place acidify the soil and weeds come to balance the problem. Irrigation water comes from the Murray irrigation scheme. Each paddock is laser levelled, and flood irrigated through timer controlled gates. After leaving the paddock, the water returns to a recycling dam from where it is pumped back onto paddocks. During the drought, allocations fell as low as 35% but with good winter, spring and summer rainfall, next irrigation season is looking much better. Generally, Mark irrigates every 10-14 days (conventional neighbours irrigate every 7 days). However, during the drought the subsoil dried out so much that he had to come back to every 9 or 10 days. Alex Podolinsky has stressed the importance of good rotational grazing and strip grazing for over 60 years. Mark and Lynne’s rotational grazing set up evolved over time. They now have the young stock, the dry cows and the milkers on three separate rotations, in three separate areas. Under this system, each group gets fresh grass, and doesn’t have to follow another group, with worm implications, and also eating the best grass lower than ideal while leaving the not so good grass. Mark did a pasture feeding course where he learnt a lot about the exact optimum stages of grass growth. They have a total of 90 paddocks, many of which are around 3 hectares or even less in area. Each paddock is strip grazed with electric fences. Mark has two electric fences in the paddock, so that he just drops one when the cows need to be moved, and they can go straight in to the next bit. With strip grazing he can get almost twice the feed out of a paddock and has so much more control than if the cows were given the whole paddock at once. Optimum height after grazing is 4-6cm (2 inches). If the cows start to wander back and eat the regrowth (back-grazing) you have left them there too long. Back grazing sets the grass back badly. Optimum height before grazing varies with the time of year and the species involved. The predominant grass, rye grass should ideally be at the three leaf stage. Once the fourth leaf starts to grow, the first leaf dies. However, in spring, this doesn’t apply, as the grass grows so much more quickly, and can have five or six leaves. Mark doesn’t look too far ahead of the milkers – he looks at where they are going tomorrow and where they were yesterday to determine how the rotation is going. If you are moving them too quickly, you can cut the paddocks into four instead of three, add more hay or silage, or, for instance, graze pastures until 11am and then put them in a non-pasture feeding area with hay and silage. The balance between what’s good for the pasture and what’s good quality feed for milk production must be right. In spring the rotation may be down to 20 days, and in February, when the paspalum takes off, it may go down to 15 days. Paspalum mustn’t be allowed to get away too much. For one thing it makes oversowing very difficult, and this year, with summer rains, Mark had to top the paddocks and rake the paspalum off to the sides so as not to block the sowing machine. In winter, the rotation may go out to 90 or 100 days. Mark has a very good computer program to help with rotational planning – he enters a rating for each paddock (poor, good, excellent etc.) and the program calculates how many feeds you will get from it. It is very much dependent on the farmer’s observation and assessment of the pasture. It was a good training tool for a few years but now Mark knows instinctively how to manage the rotation. However it will still be useful when they go away, for their relief worker to accurately manage the rotation. In the past 30 years, Mark has only applied small amounts of Guano at about 50 kg/ha to help establish pastures after dry periods, when sowing a Millet crop. Small amounts of Lime or Gypsum (300 to 500 kg/ha) have started to be applied annually, to help gradually lift calcium levels in the soil. Mark turns the material several times while it is building up, by pushing it over with the front end loader. He keeps it at no more than 60cm in height to avoid it heating up before the heap is built. By the time he is ready to build the heap the material has been well mixed already. He uses a Krone manure spreader with a metal cowling over the beater blades to build the heap, moving forward progressively as it comes up to height. Mark monitors the temperature carefully, trying to avoid temperatures in excess of 45 C. Only when the temperature drops to 35 C does he order the Biodynamic compost preparations (sometimes called preps). He makes sure that the preps are inserted in the heap within a few hours of them arriving in the mail. Even after the preps are in, Mark only covers the heap with straw or old hay in stages from the bottom up. He feels that in this way, heat can escape more easily. Only when he is satisfied with the temperature will he finally cover the whole heap. In this low rainfall climate, he leaves a 60cm wide flat top on the heap to allow rain to get in. When deciding when to spread the compost, many factors have to be considered: what will the weather do, what’s the grass cover, when will the next irrigation water come? If a compromise has to be made, Mark prefers to spread when the compost is a few weeks off being mature rather than a few weeks after it matures. He has noticed that, even if there are still some green bits in the heap, by the time it is carted to the intended paddock (by truck) and dumped in a heap for a few days, the extra aeration finishes it off quickly. Mark drives the manure spreader up and down the paddock (metal cowling removed) and on each run, his father drops a front end loader bucket in. This way, the spreader is not put under undue strain by carting a very full load to the paddock and spreading it, and the weight on the pasture is minimised. The pasture should have a good grass cover (100-150mm), the compost should be spread in the late afternoon, and the paddock is irrigated soon after spreading. Good grass cover helps shade the compost, and irrigation helps it incorporate with the soil. Mark arranges things so that straight after spreading one compost heap, he builds the next one, while the spreader is still dirty. After building the heap he hoses the Krone down thoroughly (it should ideally be shedded for longevity). The 30,000 trees planted are all natives. The first plantation was of eucalypts from northern New South Wales, which suited the warm climate and irrigation water, but when water became scarce during the drought, they struggled. Later plantings were of trees from the local area that suited the Superb Parrot, a beautiful but endangered species. The Petersons are hoping to attract them to their property, and help establish links to the Barmah State Forest habitat. In hindsight, they would have planted a higher percentage of understorey species and fewer eucalypts. In drought times the larger eucalypts compete with the pastures and some plantings have had to be thinned. Not only do the tree plantings provide shelter for stock and pastures, and bring nutrients up from deep in the subsoil, but they also provide all the Peterson’s firewood requirements - they will soon also be able to sell firewood. Mark and Lynne, together with share farmers Rob and Rory Shepherd, run a mixed herd of mainly Jerseys and Friesians, resulting in milk with about 5% butterfat. Rob and Rory are breeding into more Illawarra/ Ayrshire cattle as they are a naturally lower cell count breed and a bit more versatile as they grow out all the males to 3-4 months of age for other Biodynamic farmers to finish off for the Dairy beef market. Over the next few years they intend to lower the butterfat levels as some people don’t like their milk to be too creamy (though a low-fat Biodynamic milk is also produced at the dairy factory). Because there are currently only three farms supplying Demeter certified BD milk for Victorian consumers, the pressure is really on to produce the highest quality possible with very even production levels. To maintain even production, they have two calvings a year, in Autumn and Spring. Breeding is three quarters A.I. and one quarter natural. They use A2 bulls as many consumers are now asking if their milk is A2. They choose bulls for medium stature and ease of calving rather than high production. Mark generally has to help only one cow per calving group, generally a turned foot or other simple problem. Apart from grass, hay and silage, Mark and Lynne feed cereal hay and a little grain. Mark likes grain as a way of getting the cows into the shed and as a supplement to their diet, but not in large quantities. In winter he will feed a couple of kilos per cow per day (up to 3-4 in the drought when feed was very scarce), but when grass is growing well he cuts back to a kilo. All feed that is bought in is from Demeter certified BD farmers. During the drought, when feed became very scarce and expensive, Mark found that buying water to grow more fresh grass was actually more economical. The cows and calves are remarkably healthy and free of problems. Chemical drenching is not necessary and antibiotics are never used. Over the years, animals that have problems are culled, so a strong herd has been selected. Cows are never brought in from outside the system (heifers occasionally are). Bloat is very rare, despite no preventative treatments. Mark has lost only two cows to bloat in the last twenty five years. Milk fever is uncommon and getting less and less. Mark takes the cows off pasture a few weeks before calving and gives them plenty of cereal hay and a little bit of grain. If milk fever occurs, it is usually in older cows, and Mark is able (under certification standards) to use a calcium injection to cure it. Cows are dried off by stopping milking. Dry cow treatments are never used. Mark has to watch somatic cell count carefully to maintain the high standard and unusually long shelf life of the milk. Udders are not washed unless dirty. Small amounts of dirt are wiped off with paper towelling. If a cow has gone down in the yard, the udder is washed and usually dries off by itself in summer. In winter, paper towel is used to dry the udder. Mark has tried teat spray made with 40mls of BD tea-tree oil in 25 litres of water with 3 litres of glycerine (glycerine helps soften the teats), though he has now returned to iodine teat spray. The cell count is usually around 200 (industry standard is 250) and very little mastitis occurs. When it does occur (usually in older cows), if in a late lactation cow, she will be dried off. An older cow might be culled straight away. Younger cows will generally fully recover. An older cow may subsequently have a dry quarter and be milked as a three titter, but if she gets another bout of mastitis she will be culled. Sometimes a cow will develop a sore foot. Mark first cleans it out with a brush and water. One in ten will have a stone lodged which caused the problem, but if it is an infection, he presses copper sulphate into the foot and then tapes a kitchen cloth packed with copper sulphate and rolled into a cigar shape between the claws. He tapes diagonally from the claw to the top of the foot, not around the ankle as that restricts blood flow. The dressing is removed after a few days. Bad cases are kept in a small paddock near the yard to save them walking for a few days. Foot problems can be associated with feeding higher levels of wheat. Barley and triticale don’t cause problems, and if Mark has to use wheat he will combine it with other grains. As to fertility, very few cows fail to get in calf and Mark doesn’t have to cull for fertility issues. Fertility is partly related to the higher levels of selenium in Biodynamic cows. Mark says that one of the main advantages of Biodynamics is cost: “when the soil is right you get a healthier system and a healthier animal that doesn’t need treatment for parasites and things. The animal can look after itself from an internal point of view, as long as they’re getting a balanced diet No need to add medicines and treatments. One thing other farmers are amazed at is that we don’t have any problems with worms, liver fluke or other parasitic problems. They can’t believe it. We’ve been doing this for 25 plus years – the guys at the abattoir are amazed that our animals have never been drenched yet they’re parasite free. Mark and Lynne are currently milking 160 cows building it up to 200 in the next few years, and growing most of their hay. The cows are milked in a 12 aside herringbone dairy, and produce 5000-5500 litres each per year. This is relatively low compared with cows on conventional farms, but they are smaller bodied and cost much less to feed than the very large cows on many conventional farms. They also have a much longer productive life than conventionally farmed cows. The milk has been given an exceptionally long shelf life by the dairy factory and some time back won The Age Epicure blind taste test in which a panel of expert tasters compared milks available on the Victorian market. It was the only milk to be awarded the rating of Outstanding. Matthew Perger, Head of Coffee at St Ali’s, South Melbourne is one of many Melbourne baristas using Biodynamic milk in their coffee: “Mark and Lynne Peterson’s Biodynamic milk is the most delicious milk I’ve ever tasted. Their farm is certified Biodynamic according to Demeter standards, and their cows are some of the luckiest in the world. At St. Ali and Sensory Lab, we’ve been using Mark’s milk for four years. It’s about twice as expensive as conventional milks and we experience obvious seasonal variation but we wouldn’t change a thing. Straight out of the bottle, the milk tastes a bit like liquid vanilla ice cream, and mixed with coffee it’s an absolute delight. It’s the best we can find, consistently winning every blind taste test we can throw at it”. The Petersons have retained their high milk payments despite the current low industry returns which have drastically affected most Australian dairy farmers’ incomes. The Biodynamic Marketing Company is looking at sending the milk interstate as well, and as demand rises, other BD dairy farms will be required to fill the demand. St Albi's Video talks about Petersons individual milk market. The content of this website is provided for information purposes only. No claim is made as to the accuracy or currency of the content on this site at any time. The GV Co-Op do not accept any liability to any person for the information or advice (or the use of such information or advice) which is provided on this website or incorporated into it by reference. No responsibility is taken for any information or services that may appear on any linked websites. We make every effort to ensure that links on this site are current. If you find a link that does not work, please notify us by email on the contact us page.